An essential step to keeping your roof in tact is finding the right Hicksville roofing contractor to partner with, for all of your service needs. Ask around and locals will tell you the same thing – Magnum Contracting Group is the best name in the business. We have an enormous sense of pride in the work that we do and are honored to be a part of helping people take care of their homes. Your house is your biggest and most important asset. Your rooftop plays a large role in protecting your structure from the elements, as well as the people and property inside. So it is of the utmost importance that you take care of the roof, or call in true industry experts to handle it for you. The bottom line is that we are dedicated to providing each of our customers with the best possible service there is. We will treat your roof with the same care we would our own, if not more so. Don't keep putting off getting service that is likely overdue by now. A lack of maintenance plays a large role in ending up needing repairs. Assuming that your roof will be fine and not getting service along the way will end up leading to major problems. In fact, you may end up needing replacement before it should be time. Not getting inspections is another common issue. An inspection enables an industry professional to take a look at your roof and determine its current condition. This is a vital step in preventative maintenance what helps eliminate the likelihood of emergency repairs creeping up. Storms wreak havoc on your roof. Your rooftop is in place to help protect your home from the elements. However, sometimes the elements are too much to take. Hail, heavy rain, lightning and so much more can lead to a roof that need major repairs or replacement. At some point the time will come and roof replacement will be your only option. 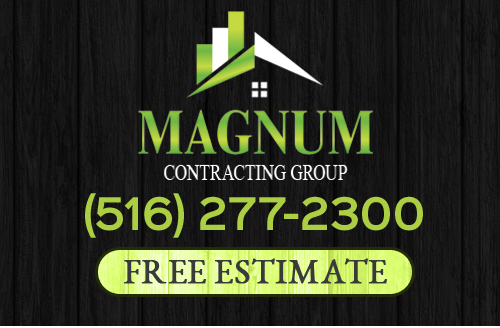 The good news is that Magnum Contracting Group will be there for you, no matter what your roof related service needs are. Our Hicksville roofers take this line of work seriously and look forward to showing you, in person, what a difference quality makes. If you are looking for a professional Hicksville roofing contractor then please call 516-277-2300 or complete our online request form.